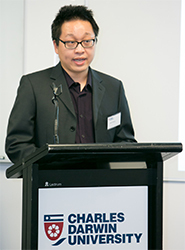 Charles Darwin University is a member of the Innovative Research Universities group. Innovative Research Universities (IRU) is a network of six universities committed to inclusive excellence in teaching and research in Australia. The IRU group commitment is to reach and serve local and global communities through an effective response for all who seek our services at the highest standards in teaching, learning and research. Charles Darwin University (CDU) is recognised for its research expertise and leadership in tropical and desert knowledge of the Australian and Asia-Pacific region, with particular focus on Indigenous knowledge and addressing problems of importance to people of the region. IRU members are Charles Darwin University, James Cook University, Griffith University, La Trobe University, Flinders University and Murdoch University.